Members and visitors of Prince Edward Chapter No 2109 were most honoured and delighted to welcome Colin Rowling, Assistant to the Provincial Grand Principals, to their installation meeting. Pictured from left to right, are: Colin Rowling, Colin Ellis, Brian Lees and Brian Taylor. The chapter having been opened in ancient form and the initial business having been speedily transacted the next business on the summons was the installation ceremony and Colin along with his grand and acting Provincial grand retinue entered the convocation. Colin was accompanied by David Durling, South Eastern Group Chairman, and fellow grand officer Brian Hayes. Also, in attendance was Assistant Provincial Grand Director of Ceremonies David Anderson. The team of Provincial grand officers were accompanied by other grand officers along with and other visiting companions and group officers all of which were admirably marshalled in a method known only to the chapter throughout the evening by director of ceremonies, Peter Ryan. The three principals were then installed by proclamation and as Peter announced each principal in turn, in a somewhat humorous manner akin to ‘Strictly Come Dancing’ the officers swapped their respective robes and took their positions in their newly re-assigned chairs. Brian Lees was installed as first principal, Colin Ellis as second principal and Brian Taylor as third principal. All having been efficiently installed, the chapter officers were then announced as remaining in post of office for the ensuing year. There was only one address during the installation ceremony, and that was given in a most heartfelt manner by Colin to the companions of the chapter. Colin responding with the three principals looking on at the festive board. On completion of the ceremony, Colin rose and brought the congratulations and the good wishes from the Grand Superintendent Tony Harrison, and also on this occasion, by special request, the greetings of the Deputy Grand Superintendent Paul Renton, individually congratulating each of the three principals and wishing them, their officers and companions in general, a happy, enjoyable and healthy year ahead. 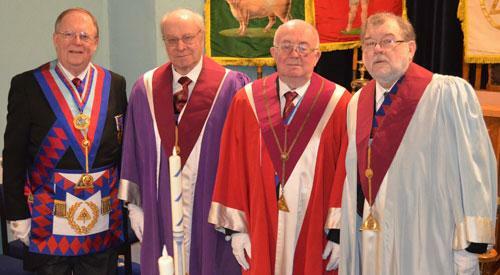 Colin, then on his own behalf, congratulated the three newly installed principals on attaining their chairs, the newly re-instated officers and likewise to the companions of Prince Edward Chapter in general on the excellent standard of the ceremony carried out throughout the evening. Colin was presented with a cheque for £100 made out in favour of the Freemasons’ Grand Charity. Colin responded to the presentation by thanking the chapter on behalf of the charity and on behalf of those ‘men, women and children who we will never know’ that will ultimately benefit from the very kind generosity of the members of the Prince Edward Chapter. The first rising brought greetings from the grand officers to which Brian Hayes responded, who similarly congratulated the companions on an interesting, colourful and different ceremony during the evening. The valedictory address was given in an assertive and exemplary manner by Alan Kennedy, which of course was clearly well rehearsed into a faultless presentation much enjoyed by all present. Colin gave an excellent response at the festive board. He made reference of Royal Arch Masonry appertaining to Masonic understanding, membership percentage increases in that out of five groups, two groups now have over 50% membership into Royal Arch and on the increase. Colin also made knowledge of dateline and historical events appertaining to the years of the chapters’ existence. Colin summed up his evening as most enjoyable and was delighted at both the camaraderie and indeed impressed with the ‘Strictly Come Dancing’ display we had all experienced and enjoyed during the evening. In conclusion, Colin thanked the chapter for their toast and indeed the ‘quiet way in which they had received his response’. The very friendly and jovial festive board which had continued well into the evening then concluded after a most convivial meeting. Pictured from left to right, are: David Durling, Colin Rowling, Colin Ellis, Brian Lees, Brian Taylor, Brian Hayes and David Anderson. Story and photographs by Eddie Wilkinson.